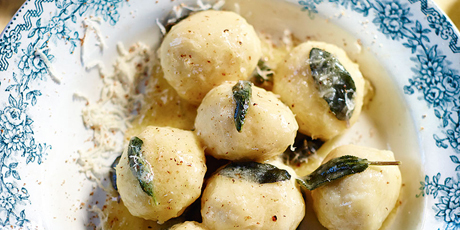 "Gnudi is a fantastic dish – you must make it. It’s elegant, light in texture, easy to make and for most people, very unusual. My dear friend April Bloomfield, from the very cool Spotted Pig in New York, has recently made this dish most famous, but it certainly dates back at least a good thirty or forty years, and is made all over Tuscany. Gnudi means naked, and quite simply this is a ricotta ravioli without the pasta (aka naked). The proviso for this dish being genius to the point where your guests won’t stop talking about it is to use top-quality ricotta, butter and Parmesan, as well as beautiful freshly picked sage." Taken from Jamie’s Comfort Food, published by Michael Joseph. Recipe © Jamie Oliver. Photography © Jamie Oliver Enterprises Limited 2014, by David Loftus. 1. Put the ricotta into a bowl with a pinch of sea salt and black pepper, then finely grate in the Parmesan and a few scrapings of nutmeg. Beat it together, then have a taste to check the balance of seasoning is right – you want the nutmeg to be very subtle. 2. Generously cover a large tray with semolina, then roll the ricotta mixture into 3cm balls, rolling them in the tray of semolina as you go until really well coated. You should get around 40 gnudi from this amount of mixture. Shake and cover really well with the semolina and leave for 8 hours or preferably overnight in the fridge (don’t cover the tray) – the semolina will dehydrate the ricotta, giving the gnudi a lovely fine coating. 1. The gnudi will only take 3 minutes to cook and I like to cook them in 2-portion batches to take care of them. So, shake the excess semolina off 2 portions-worth of gnudi and cook them in boiling salted water while you melt a large knob of butter in a frying pan on a medium heat and pick in about 20 sage leaves to crisp up. 2. Remove the crispy leaves to a plate and scoop the gnudi directly from the water into the frying pan, adding a spoonful of the cooking water. 3. When the butter and water have emulsified, take off the heat and grate over a layer of Parmesan, add just a few drops of lemon juice, then toss together. Serve in warm bowls straight away with an extra grating of nutmeg and Parmesan and the crispy sage leaves, while you get on with the next batch, wiping the frying pan clean between batches. Welcome to the naked club.